« House Shopping 101: Roof Ready? This is the sixth in a series on construction defects found in the Greater Toronto Area, Ontario, Canada. This is a worse than useless basin. It would be useless if it was a solid basin, but because the builder installed a perforated basin, this is doing more harm than good. Not only is it NOT collecting water from the foundation drainage, it is collecting water from the ground below the slab, which is not necessary and creates an additional pumping requirement. There is water in this basin even though there is no infeed pipe. This is new construction completed in 2018 in Oakville. The purpose of the sump system is to collect water from the foundation drainage pipes that are installed below ground, around the perimeter of the house at the same depth as the footings. These perforated pipes are also referred to as “weeping tiles”, “weepers”, or sometimes by “Big O” which refers to a brand name. The purpose of foundation drainage system is to reduce risk of water pressure developing against the outside of the foundation wall, especially at the junction of the foundation wall to the footing, where there is risk of leakage. The foundation drainage system is prescribed by building code, it is not an option. Details of sump installations are scarce in the code,hence the loophole that allows builders to install perforated basins. 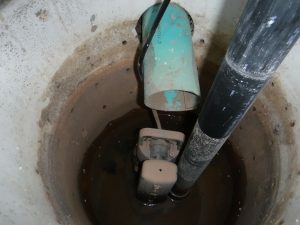 Photo at left shows a sump basin with an infeed pipe, albeit a poor quality one. That is the green pipe. It is a modified piece of pipe cut along the length and squeezed inside the foundation drainage pipe. It will leak along the cut seam and at the junction with the foundation drainage pipe. 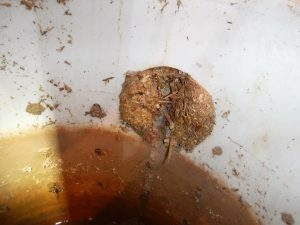 In order to find this defect, the sump lid has to be removed to get a full view of the basin. This issue could go undetected for many years, as a foundation drainage defect may not show any symptoms unless a house is in a very wet location. 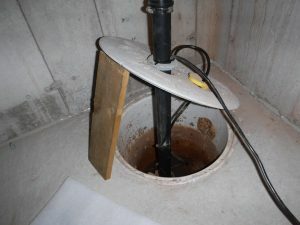 Another issue is that the sump is installed in a cold room where the outfeed pipe is subject to freezing in winter time. It’s a common sounding from the selling parties on new or almost new homes. “Don’t worry, the City inspected it”. As an inspector serving the buying community, I am often amused by that statement. My income on new and nearly new home inspections relies directly on identifying the leftover issues after all the builder and municipal inspections are complete and the first owner has taken possession. These issues don’t go away on their own, and I also find “builder issues” on resale homes, even up to 50 years after original construction. Don’t hesitate to have new or nearly-new homes inspected by a professional. The homeowner now must pursue the builder through the Tarion warranty program to get this made right. The risk with this repair is making sure that the new pipe is properly connected to the foundation drainage system. 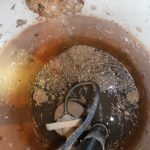 There is a risk the builder will use makeshift measures and install a “dummy” pipe at the basin that is not connected.